One man in South Australia is thanking his lucky stars for backup battery power in the last 24 hours of devastating power outages. Brian Gillespie from Eden Valley in South Australia had his mini Tesla battery power station keeping his home power functioning when the rest of the state was plunged into darkness. “Due to these severe storms and resulting blackouts, Natural Solar has received a huge number of enquiries from customers South-Australia wide, each of them seeking more independence from the grid. In the past 24 hours there has been a 228% increase in enquiries from customers South Australia wanting to know more about battery power, with their locations directly correlating to more severely storm affected areas. This trend has swept across the country with a 148% increase on enquiries Australia wide,” says Chris Williams, Managing Director of Natural Solar. 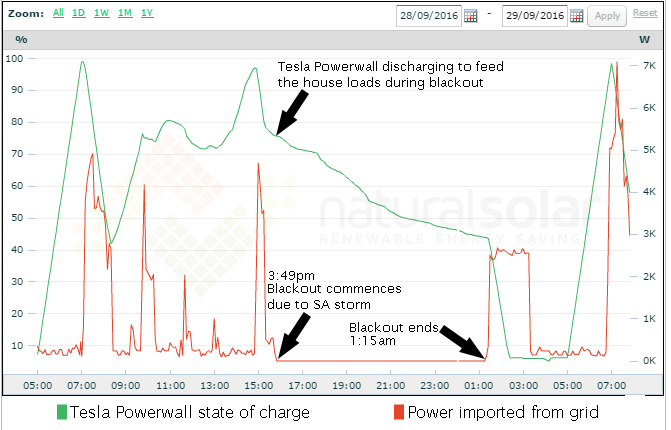 Graph from the SolarEdge Monitoring Portal showing the Tesla Powerwall’s state of charge during the blackout due to the storms in South Australia on 28/9/16 between 3:49pm and 1:15am. “As other states and territories prepare for the massive storm to sweep through their regions over the coming days, we expect to see the influx of residential and commercial interest in battery power continue, with people exploring home battery power storage solutions and backup power. The brilliant thing about the Tesla Powerwall is the ability for consumers to consider their weather forecasts and any warnings, and purposefully charge their batteries prior to any power outages occurring. For the first time ever, Australians really have the ability to take power into their own hands and have control,” concluded Mr Williams. Get a Tesla Powerwall quote in 60 seconds! Can the Tesla Powerwall provide backup power during blackouts? It sure can! 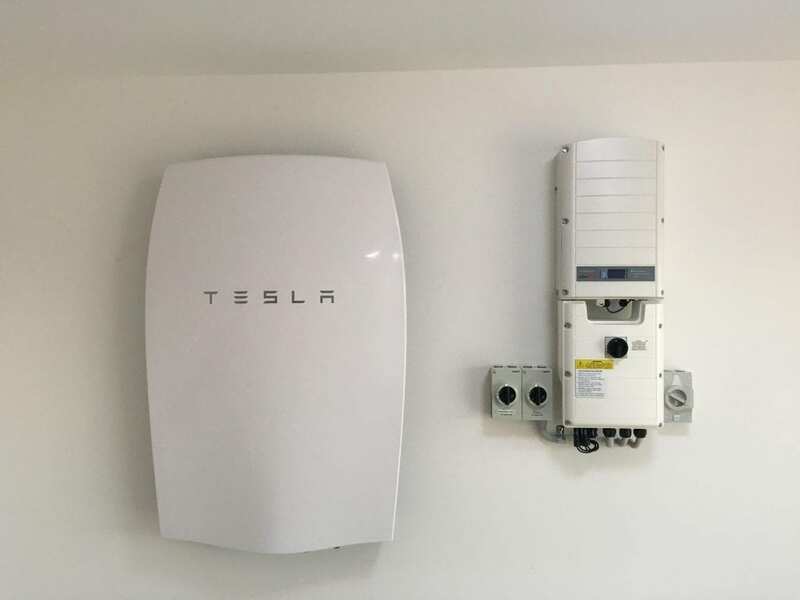 Though the Tesla Powerwall is the battery which stores the power, to get backup power during blackouts you require an intelligent inverter which is able to identify when the power goes out and then boots the inverter and Tesla Powerwall back online after about 5 seconds. Even better, if this occurs during the day and your solar panels are still producing power, your battery power is only used to cover the remaining electrical load after the power generated by the solar panels has contributed what they’re producing to minimise the drain on your battery.